So why were the stories of home to vote shared wider than the personal stories of those who ‘went to England’? At the end of the Citizens Assembly and the Joint Oireachtas Committee, Ireland had a lot to celebrate - they were having the most honest discussion about abortion realities in the world to date. With a few exceptions, the conversation was open and respectful. The testimonies from citizens and politicians admitting to the public they’d changed their stance to pro-choice after being provided with the facts was remarkable. While much of the world’s politics is moving to the right, Ireland was prioritising statistics, experts and inclusivity. Never being known to pat themselves on the back, Irish people couldn’t see they were doing something spectacular. The trademark Irish guilt prevented many from grasping the breakthrough that “Catholic Ireland” was making. It was international newspapers who sang the praises of the global Irish campaigning for awareness. The London-Irish Abortion Rights Campaign made it into the New York Times before the Irish Times. 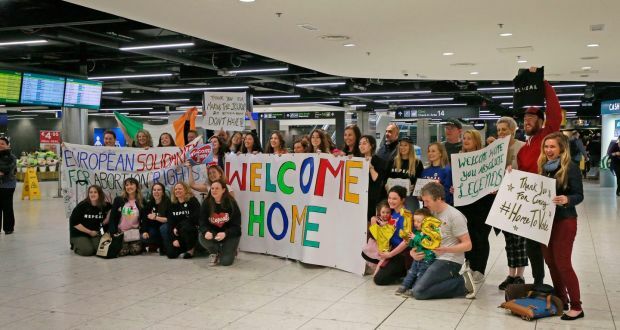 As the hashtag began to trend, the international media were again the first to embrace #HomeToVote and cheered for strangers heading home with their hearts on their jumpers. Activists in Ireland were invigorated as Irish-abroad returned home and joined the canvassing efforts. ‘My editor pulled the piece because I couldn’t find anyone travelling home to vote for the No side’. A message we received regularly in the final weeks when articles were pulled and calls were cancelled at the last minute - and who would blame them? The No campaign knew the intricacies of broadcasting regulations (and loopholes) beyond any editor. The Irish press were terrified to produce anything but balance, missing the phenomenon of a country turning the tide for fear of bias. And even after the vote, it was the English Gogglebox viewers who defended the cheers of joy, while the national press published parochial condemnation of the celebrations. #HomeToVote came at a time when Ireland needed an injection of self-congratulation. Ireland’s global citizens really travelled home to reassure Ireland it was making the right choice. With each airport hug at arrivals was a sense of validation for our friends and families. In the end, #HomeToVote may not have changed the result, but it did change the country.